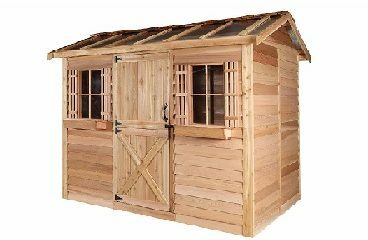 The Cedarshed HobbyHouse is a great shed kit for the hobby enthusiast. Use your HobbyHouse for arts & crafts, a cozy sewing room, or storage.The skylight allows natural light to flood into the interior of the shed thus allowing you to carry out various crafts and pastimes from scrap booking to woodworking. Upgrade the 2 fixed windows to awning windows to bring in fresh air. For added security, upgrade the Dutch door to a solid cedar door with a lockable handset.